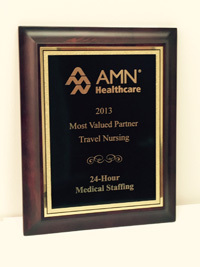 24-Hour Medical Staffing Services is a leading provider of licensed nurses, covering a wide range of specialties. Our proprietary database of medical professionals is made up of experienced clinicians and practitioners dedicated to providing your patients with the high standard of care to which they are accustomed, combined with the kindness and compassion they deserve. 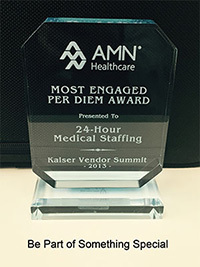 We are a Joint Commission Certified healthcare staffing company that has been honored by AMN Healthcare as a Most Valued Partner-Travel Nursing and for our high volume, per diem nursing support of Kaiser Permanente. 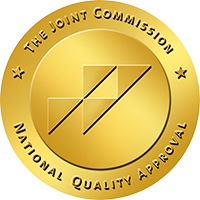 Every healthcare professional who applies for employment with us undergoes comprehensive screening and credentialing to ensure each candidate possesses the necessary training, licensure, and clinical competencies. We also perform background and reference checks, test candidates’ interpersonal skills, and evaluate personality traits before matching their skill sets to your specific requirements. This ensures that placements are beneficial for both you and the candidates. You may be assured every specialist you hire from us is ready to provide skilled, efficient, compassionate care in a manner that conforms to the regulatory requirements of your facility. We regularly communicate with our healthcare professionals and staffing specialists to listen, support and incentivize them throughout their employment. In addition, periodic reviews are conducted to evaluate accomplishments and set goals to optimize future performance. Also, every employee and client receives a copy of our company newsletter. It provides internal updates as well as articles about medical issues, trends, best clinical practices and links for continuing education. Our healthcare professionals are employees of 24-Hour Medical Staffing Services. We provide health and dental insurance, a vision plan, a flexible spending account and automatic deposit, as well as the option to participate in a 401k retirement plan. We are fully insured for professional liability and workers compensation. This relieves you of any legal liability and employment obligations related to our workforce. Please use this form to inquire about staffing services.